Tonight will bring the opening installment in a three-episode American run of Sherlock, BBC One’s surprisingly respectful and energetic updating of Arthur Conan Doyle’s Sherlock Holmes detective saga. These eps are being shown as part of PBS-TV’s Sunday Masterpiece Mystery! series. Check your local listings for showtimes and channels. I definitely had my doubts about adapting Holmes and his loyal biographer, Dr. John H. Watson, for service in the 21st century. My vision of Conan Doyle’s most popular characters always has them surrounded by hansom cabs, gaslighted thoroughfares, and demure women with too many petticoats. Because it respected those historical conventions and even went so far as to restore the author’s conception of his crime-fighting heroes as young, vital men (and despite its razzle-dazzle, videogame-like pacing), I was quite fond of the 2009 Robert Downey Jr./Jude Law big-screen presentation, Sherlock Holmes. But the notion of time-shifting Holmes and Watson to a London filled with cell phone-wielding business folk, closed-circuit cameras, and lap-dancing clubs ... well, that just didn’t seem proper. Not proper at all. But then I had an advance opportunity to screen this new Sherlock, and my opinion changed. Quickly. Series co-creators Steven Moffat (the current showrunner for Doctor Who) and Mark Gatiss have updated the Holmes legend, to be sure. They’ve made the young “consulting detective,” played by Benedict Cumberbatch, a phone-texting fiend, whose periodic escapes into cerebral consideration of knotty mysteries is fueled by nicotine patches rather than pipes (thus spawning a nice twist on an old Holmes line: a “three-patch problem”). Meanwhile, army physician Watson (Martin Freeman) has recently returned--injured--from service in Afghanistan, much like the original doctor, but it seems his limp is more psychosomatic than real. (His psychotherapist thinks he can banish his personal demons by blogging about his war experiences, but Watson hasn’t yet caught the writing bug.) A more worrisome problem for Watson might be his estrangement from his gay sister, who has recently divorced her wife. All of that is window dressing on durable crime-fiction lore, though. The real attraction of this updated Sherlock can be found in its taut scripting and complex character development. 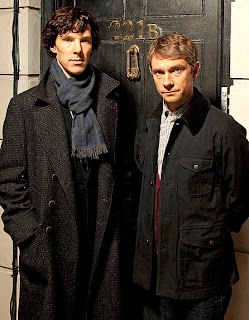 In tonight’s episode, for instance--titled “A Study in Pink” (a tip of the deerstalker to Conan Doyle’s first Holmes tale, A Study in Scarlet)--we find a down-on-his-luck Watson being invited by Holmes, rather presumptuously, to join him in his cluttered digs at 221B Baker Street. Watson isn’t so very sure that he wants Holmes as a roommate, or involved in his life in any respect, until he’s asked along to help investigate one of several “serial suicide cases” that have left the London constabulary--especially a stressed-out Detective Inspector Lestrade (Rupert Graves)--bewildered. Holmes has a titanic ego, but he is also demonstrably brilliant, though equally eccentric. (He describes himself as “a high-functioning sociopath”). And while some cops suspect he’s crazy and dangerous, Holmes’ adrenaline-fueled escapades provide much-needed palliatives for the depression Watson has felt ever since departing the battlefield. If Holmes has one enemy above all, even above the not-yet-seen Professor James Moriarty, it’s boredom. And that suits his new flatmate just fine. Holmes: You’re a doctor. Actually, an army doctor. Holmes: Seen a lot of injuries then, violent deaths. Holmes: Bit of trouble too, I bet. Watson: Of course, yes. Enough for a lifetime. Far too much. There’s good reason why Sherlock and its titular star, Cumberbatch, both walked away with Crime Thriller Awards earlier this month: they’re just so much damn fun! This isn’t a program understandable only to Holmes aficionados, though if you’re familiar with Conan Doyle’s stories, you will almost certainly catch some in-jokes. American viewers will be able to enjoy two additional episodes, “The Blind Banker” and “The Great Game,” on October 31 and November 7. And BBC One has already ordered a second series of the show. 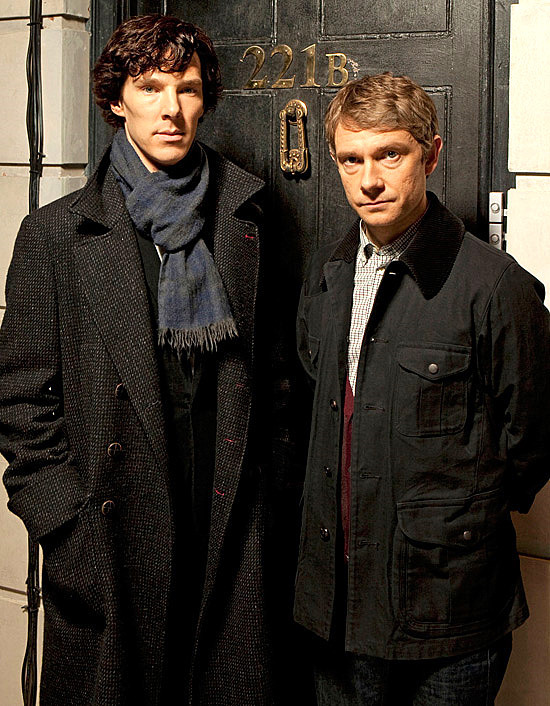 READ MORE: “Benedict Cumberbatch Interview Sherlock; Also Talks About Steven Spielberg’s War Horse,” by Christina Radish (Collider.com); “The Game’s Afoot--The Return of Sherlock,” by Scott Weller (Kool TV); “PBS’ Sherlock--A Review,” by Scott D. Parker; “21st Century Sherlock,” by Adam Graham (The Great Detectives of Old Time Radio). I enjoyed the show tonight. I weary quickly of modern mysteries though, with their reliance on computers, so I don't know if this series will have staying power with me. Only two more episodes though, so that's not a big concern. I thought it was terrific. Finally something that doesn't seem written by a BBC writer chained to the desk for the last forty years. Btw, Moffat is the current Doctor Who showrunner not just a "sometime Doctor Who screenwriter. What I liked most about Moffat's Holmes was he is more human than Doyle's Holmes. Holmes' reaction to learning "Harry" was a woman connected me to the character in ways Doyle's always perfect Holmes never did. And unlike other modern adaptations, Moffat brought the character into the modern world with his soul intact. Like you I was wary when the BBC showed this series but also like you I really enjoyed it and wasn't surprised when they got the award. Much better than the recent film version. Can't abide all that computerised action. Total garbage. Look forward to seeing the second series. Michael: Thank you for pointing out Steven Moffat's more significant role in Doctor Who. I have corrected my reference, accordingly. What a blast! I did not care much for the Downey version outside of Jude Law. This Sherlock updates without begin disrespectful to the Doyle.